Our Travel-Kleen is perfect for on-the-go people. The Travel-Kleen is designed with travel and portability in mind. 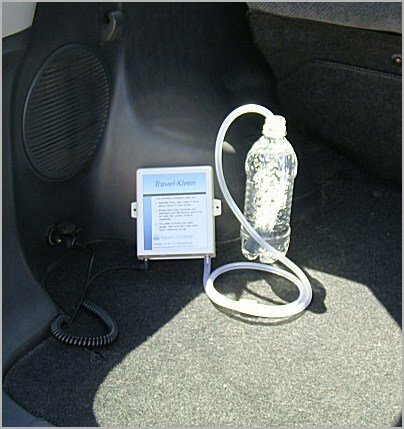 At just over 1 lb, it is light and easy to carry, with the option of using it in your car, vacationing and overseas traveling. With this 12Volt DC portable unit you are only minutes away, where ever you may be, from enjoying fresh, clean, purified drinking water with the included cigarette lighter adapter, or in a hotel room, with the included A/C adaptor. This unit ensures that everyone can have clean, fresh water in places where it is hard to find. It gives you all the benefits of the Kleen-Stream while being portable. The Travel-Kleen is great for RV use, camping, vacationing, and overseas traveling; anywhere space is limited and/ or the water may not be safe. With this portable unit you are only minutes away, where ever you may be, from enjoying fresh, clean, sanitized drinking water.